Combining expertise to pursue portability, smaller size, and power saving, Toshiba pioneers laptop PCs, creating a new market. Beginning around the mid-1970s, personal computers became increasingly popular among hobbyists, including in the form of assembly kits. Businesses began to use PCs in the 1980s, and the market grew rapidly. The IBM PC, developed by IBM in 1981, became the industry norm and dominated the global market as the first full-fledged business computer. Toshiba, which had been expanding its scope of business to small machines and office automation equipment, released a Japanese-language word processor called the JW-10 in 1979, followed by the Rupo series in 1985. These products were successful, but Toshiba had fallen behind other companies in the PC business. Desktop PCs with proprietary specifications, no matter how unique, were not adopted by the market unless they were compatible with standard machines; i.e. the IBM PC. Toshiba's PC division was operating at a deficit and the company was on the verge of quitting the business. The only way for Toshiba to continue in the PC market was to introduce an innovative computer that the market had never seen. Toshiba believed that it would have a popular product if it pursued mobility, smaller size, and power saving to make a portable computer that was fully compatible with standard machines. The company also knew it would be able to take advantage of technologies it had accumulated in the development of Japanese-language word processors. A team of engineers started development of a laptop PC in April 1984, according to the specifications and development schedule decided by the team leader. At first, the engineers thought that the project would be impossible to complete. However, they were eventually able to overcome the various problems and somehow achieved their goal, thanks to some technical assistance from Toshiba's Ome Operations facility as well as the fact that most of the key components that went into building the smaller laptop PC were developed in-house, including semiconductors, a 3.5-inch floppy disk drive, and a large liquid crystal display. The new product weighed only 4.1 kg, one-seventh the weight of a contemporary desktop computer. 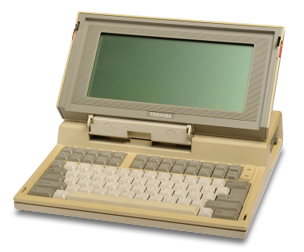 In April 1985, Toshiba released the world's first laptop PC, the T1100, in Europe. The company had given up on the PC business in the U.S., and the Japanese market at the time was dominated by the NEC PC-98 computer lineup, which was not compatible with Toshiba's machine. The T1100 was an innovative product but had some problems. It used a 3.5-inch floppy disk drive, not the 5-inch type more commonly in use. The machine was also not very affordable (costing around 500,000 yen). Some people thought that it was too early to launch the product, but the head of Toshiba's PC business in Europe believed in the potential of laptop PCs and strongly promoted their sales. He convinced customers, leading software makers, and sales agents that desktop computers would soon be replaced by laptop computers. He was able to achieve an annual sales target of 10,000 machines, a feat that was remarkable for Toshiba's PC division at that time. Encouraged by the success of the T1100 in Europe, Toshiba started selling laptop PCs in the U.S. and Japan the following year. The T1100 was modified and renamed the T1100Plus, and the even more advanced T3100 (J-3100 in Japan) was developed in 1986. The T3100 was equipped with the latest technologies, including a plasma display and a hard disk drive. The product earned wide acclaim as the “king of laptops” immediately after it was put on the market, and won a number of awards. Through its technical innovation, Toshiba continued to lead the portable PC market, and was also able to make major contributions to the component market. In 1989, the company received the Okochi Memorial Production Award from the Okochi Memorial Foundation for these new technologies.